Suitable for a wide range of industrial applications, from precision sheet metal to pipe and pressure vessel fabrication. 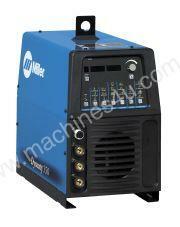 For improved weldability on aluminium and magnesium using low power. Continuous high-frequency is NOT needed because of the advanced Squarewave arc, and extended balance control allows you to fine-tune the duration of the electrode negative portion of the cycle from 50 to 90%. This provides precise cleaning control and prolonged tungsten life. Allows the operator to independently set HF starting conditionbs based upon process amd memory selection. Provides connection to 380V to 575V, three phase power without having to remove the covers and relink the power source. For TIG arc starting without the use of high frequency.